Product #47639 | SKU STFS5000800 | 0.0 (no ratings yet) Thanks for your rating! 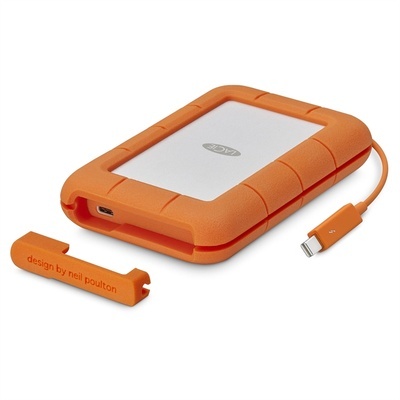 Take advantage of enhanced data transfer rates with the 5TB Rugged Thunderbolt Mobile HDD from LaCie . Not only does this bus powered, rugged hard drive offer enhanced data transfer rates, it also comes equipped with a Thunderbolt / USB-C port designed to connect the drive to a variety of Windows and Mac computer configurations. When on-the-go this LaCie drive is designed to help guard your data and the drive against the elements. The IP 54 rated enclosure features a removable cover and can withstand drops from heights of up to 1.98 m. The case also helps protect against dust and water while built-in AES 256-bit encryption keeps stored content safe from intruders.